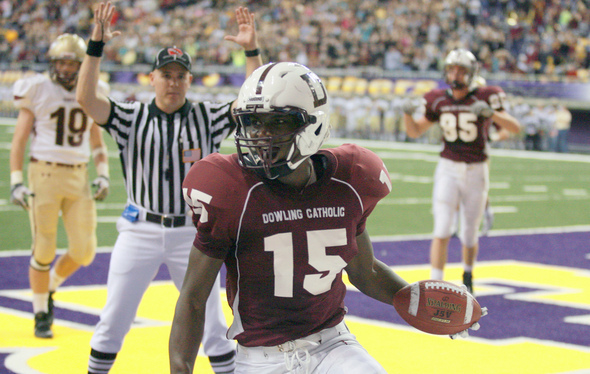 Amara Darboh celebrates the game-winning touchdown in a 2010 Iowa Class 4A state football semifinal game. Amara Darboh will sign a letter of intent Wednesday to play receiver for the Michigan football team. It also happens to be his birthday, marking 18 years since he was born into carnage. He entered this world Feb. 1, 1994, just as the civil war in Sierra Leone was beginning to escalate. More than 35,000 people died in his first five, war-torn years of life. His parents, Solimon and Kadita, were among them. Solimon was a member of the military. Amara doesn't remember much else about either of them. The 2-year-old was taken in by his aunt, older sister and other relatives in Freetown, the capital of the Western African country. They moved often, seeking refuge from the surging violence around them. He recalls little about those years. Just the rain. "I don’t know why I remember playing in the rain," Darboh said in a lengthy telephone interview this week. "I can’t remember much of anything, but I can remember that. "It’s hard for me to sleep sometimes, but whenever it’s raining, it seems like I sleep better. Maybe that's it." Darboh, now 17, has grown to become one of the finest high school football players in the country. He is a four-star wideout, ranked by Scout as the No. 32 overall player at his position. He stands a taut 6-foot-2, 200 pounds, the kind of size Michigan will lack at that position next season. He could play right away. It's another break in what is turning into a very fortunate life, thanks to football and the kindness of one Iowan family. After bouncing around Freetown, Darboh and members of his circle sought refuge in Gambia, then shortly in Senegal before finally securing a trip to the United States. They were among an estimated 2.5 million people who were displaced during the 11-year war -- or, almost half the country's population. About 500,000 left the country all together. A Christian group sponsored Darboh's clan, setting them up in a home in Des Moines, Iowa. Darboh, then 7, was cared for by his sister, Lovetta, who is 12 years older. Fourteen people lived in the house. Life was hard for Darboh as a child as he adjusted to a new town, new people, new way of life. There was a language barrier. He spoke Krio, a type of Creole language. "I’d have to repeat words over and over and over for my teachers, so they would understand me," Darboh said. "It was frustrating. You think you’re saying it right, but other people are like, 'Where are you from?’"
Grade school is difficult for those who stick out. That's especially so when you're a young African with broken English. "There were times when I didn’t know what to say to people," he said. "'Yeah, I’m from Africa, I just moved here a couple nights ago.' What else could I say?" 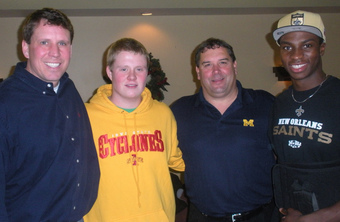 Left to right, Dan Schaefer, Max Schaefer, Michigan coach Brady Hoke and Amara Darboh. Things got better, though. His improving English gave him strength. He was likeable, with a wide smile. He was athletic, too. Always athletic. That's how he met Max. Darboh, now 8, received a scholarship to the Beaverdale Little League, where he was put on the same team as Max Schaefer. Max's father, Dan, was a parent assistant. Amara and Max became like brothers. Dan became close to him as well, noticing the unique bond between his son and Darboh. But he also sensed there was a need in Darboh's life. One time, Dan asked Darboh to join the basketball team he coached. Darboh jumped at the opportunity, but didn't have shoes. They went to Foot Locker for a pair, and Darboh was adamant he already knew his size. They settled on a pair of Air Jordans. "Well, come to find out, he didn’t want the other guys in his household wearing his shoes. He wanted to make sure they were smaller than everybody else's so they wouldn’t want to take them." Darboh was living with six people in a two-bedroom apartment at the time, Dan said. It wasn't much longer before Lovetta, Darboh's sister, approached Dan and his wife about adopting Amara. "It didn’t take us more than a couple hours to decide," Dan said. "We were pretty surprised. It’s not every day you’re asked to adopt a child. "But when she approached us -- I don’t want to get spiritual or anything, because I’m not a spiritual guy -- but it’s kind of like it was meant to be. It felt right, and it’s always felt right, looking back on the years we’ve had together." Darboh's bond to the Schaefers, and especially Max, continued to grow over the years, even as he developed into one of the top talents in the country. He played soccer first. Dan says that probably was Darboh's best sport, one he used to play in cloth sandals back in Sierra Leone. Later, it became basketball, before football finally came around at the start of his freshman year at Dowling Catholic High School. Darboh originally didn't intend to play, but the varsity coach, Tom Wilson, had noticed his athleticism. Wilson approached Darboh a couple of weeks into the season about joining. "To be honest, I just started playing because Max did, and some of the guys we hung out with did," Darboh said. He joined the team several weeks late. He scored three touchdowns in his first game, Dan Schaefer said. "Funny thing is, he still needed to get eye glasses," Schaefer added. "His vision wasn’t great, and we knew that, and I’m like, 'Gosh, who knows how good you could be?'" After becoming a star his sophomore season, Darboh, still big on basketball, traveled the country for football camps at schools such as Nebraska, Iowa and Notre Dame. As the offers started to roll in, Darboh began to realize his future was in football. Notre Dame. Florida. Iowa. Wisconsin. Nebraska. Michigan. The one-time war-time orphan had earned a ticket to the big time — and a free education. "The best way I can describe him is he’s a survivalist," Schaefer said. Darboh said he chose Michigan mostly because of the coaching staff, and how genuine he felt they were during the recruiting process. He also developed a close rapport with current players, including fellow receiver Roy Roundtree and his future quarterbacks, Denard Robinson and Devin Gardner. He could be catching passes from them sooner rather than later. Amara Darboh's tattoo features two angels and his nickname. Darboh has been clocked as low as 4.42 seconds in the 40-yard dash, which is terrific speed, especially for someone of his frame. He also is praised for having sure hands, and his attention to the blocking game. "I think he does have some potential to play right away," Scout Midwest recruiting analyst Allen Trieu said. "He’s pretty filled out. He’s good after the catch, that’s the one thing I’ve really noticed about him. "He can catch a lot of passes in traffic, and he's not afraid to go over the middle." With so much ahead of him, Darboh doesn't dwell on the past, nor does he ask for sympathy. "I’m more about moving forward, and not about the past," Darboh said. "I haven’t even really asked about my parents and going through war. My sister isn’t really that comfortable talking about it. "I don’t like to ask about the past, because bad memories come back, and I don’t want my sister to think about that. I kind of just move on." Same time, he's accepted who he is, and where he comes from. 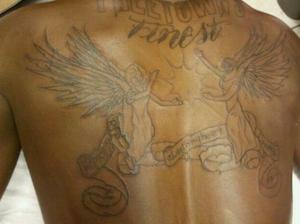 In fact, he recently got a large tattoo on his back with the words "Freetown's Finest" hanging over two angels. The nickname comes from a cousin. One angel represents his sister, who watched over him in his journey to America; the other, the aunt who took care of him after his parents' death in Sierra Leone. "I stayed with her most of the time," Darboh said of his aunt. "I was more quiet and shy, so I was mainly with her when I was growing up. ... I feel like she’s the one that taught me a lot of stuff about becoming a man." That aunt stayed behind in Sierra Leone. She died in a car accident two years ago. Darboh got the tattoo to honor her and his sister. "They raised me to be Freetown’s Finest," he said. "They raised me to be who I am." Thanks for the feedback, everyone. Much appreciated! Looking forward to seeing this guy on the field. Someone who's persevered this long in circumstances like that is well on his way to being a Michigan Man. Mon, Jan 30, 2012 : 2:50 p.m.
Mon, Jan 30, 2012 : 7:48 a.m.
Another neat thing about this is that we have another WR recruit that was born in neighboring liberia during they're civil war. He survived came to America and also is in the 2012 class. Having one player that survived a civil war in Africa committed to play to play at U of M is incredible but having TWO is almost a miracle. This young man plays a little like Braylon and has some Hemingway in him with the basketball positioning in the end zone. I already am one of his biggest fan. Great character...thanks for the story. Sun, Jan 29, 2012 : 5:38 p.m.
Wow. Welcome to the Michigan family, Amara. Wishing you nothing but all the successes in the world. Work hard, and you're bound to find them. Sounds like you already know that, though. Go Blue! Sun, Jan 29, 2012 : 5:26 p.m.
Definite props to Kyle for bringing this story to us, and major props to Amara for all that he has been through and his accomplishments to this point. Really inspiring, we all look forward to seeing what this young man can do with his God-given talents. You've got hundreds of thousands of loyal fans cheering you on Amara...we've got your back! GO BLUE!!! Sun, Jan 29, 2012 : 3:14 p.m.
Kyle, you have wrote some great individual player/future player stories - but this is the absolute best. The research and time you put into this story is remarkable and really uncharted. These stories always make us football faithful feel a little bit closer to our players and that is really what the 'Michigan Football Family' stands for. Some of us attend every game Michigan plays, and support our team as we would our own family's participation. Thanks for a great story, on a great person - who will soon be part of out family. MgoBlueForTiM.....Michigan Football - the team, the writer, the tradition. Sun, Jan 29, 2012 : 2:36 p.m.
Well Amara is one student who won't be getting into trouble while on scholarship. He won't have a sense of entitlement like so many american kids. He will be grateful for the things he has. A scholarship to Michigan. a chance to play in the big house before 115,000. Great article. Sun, Jan 29, 2012 : 11:48 a.m.
Sun, Jan 29, 2012 : 5:31 p.m.
&quot;Exploit&quot; ... as opposed to the enlightened treatment OSU players receive? There's no exploiting going on. Quite the contrary. And you know that. You're just trying to be provocative. But it's a clumsy attempt on your part. Sun, Jan 29, 2012 : 4:14 p.m.
Sun, Jan 29, 2012 : 11:45 a.m.
What a great, great story Kyle, thank you for that. How can you not root for this kid to be successful, he sounds like such a wonderful young man. And to attest to Hoke and staff on how good of a recruiters they are, here is a young man who's been through hell in his early years and he felt safe and comfortable around our coaches. That makes me so proud and glad to have the genuine guys running our program. Others can have their Urbans and Sabans and whoever else, I wouldn't trade our Head Coach for anyone. Thank you Coach Hoke for being the man that you are. To the young Mr. Darboh, welcome to one of the greatest universities in the world. Good luck to you in your academics and athletics, may you prosper to the fullest, enjoy your college years, you deserve all the happiness one can have, Go Blue!!! Sun, Jan 29, 2012 : 4:50 p.m. Thanks, Mick for those comments. A nice glipse of the human side presented by Kyle. I wish nothing but the best for Amara Darboh, Go Blue! Sun, Jan 29, 2012 : 1:12 p.m.